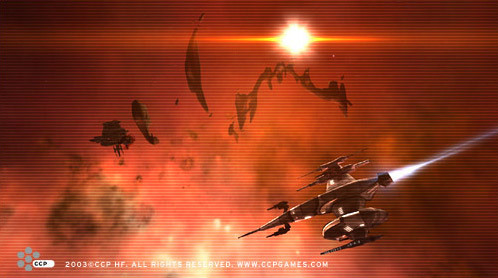 The world of EVE has had its share of turmoil and grief in its long history. For centuries space travel has been the norm and in every nook and cranny extraordinary things can be found, each with its own rich background story for the whys and when it came into existence. One only has to know where to look to find them. The long treks through dark and empty space may seem lonely, but the oasis of life at the end of the line more than make up for it. Every city visited in this vast world, every country, every planet has its own unique customs and fables from some long lost past. And some from a more recent, violent one. If you visit the Vilinnon system in the Gallente Federation you may hear about the Serpent’s Coil. The Coil is not something the locals are proud of and the Federation would rather know nothing of it. For in the Serpent’s Coil agents of the notorious Serpentis Corporation have made themselves welcome. Once the Coil was known by a much simpler name - Lookout Post 7-0Z. Built during the Gallente-Caldari war it acted as a military outpost against marauding Caldari ships. When the war ended the purpose for manning the base ended, too. A token force was kept there for a few years, before the station was abandoned completely. At that time local authorities had hopes of turning the system into a mining haven, but those hopes were quickly dashed when the Serpentis Corporation occupied the now derelict military base. The move was a stunning effrontery to the Federation, but Serpentis had timed their move well. A new federal administration was coming into power and it took them several months to sort themselves out. By that time Serpentis was firmly entrenched and when a few half-hearted attempts to dislodge them failed, the Federation adopted a policy of ignoring the problem - the Vilinnon system was too under-developed and insignificant in their eyes to warrant a large military operation. The Serpent’s Coil was there to stay. The location of the Coil is of great interest to astrophysicists. The military base is located close to some very peculiar rock formations floating in space. Rumors abound about their origin, equally divided between natural explanations for the phenomenon and the more intriguing ones - that the huge rock boulders are the result of some strange experiment now long forgotten. The truth about the strange rock formation may always remain on the rumor level while the Coil remains in the hands of the Serpentis Corporation, which uses the old military station as a distribution base for its illegal merchandise. Naturally, it is not very fond of scientists, sightseers or other space tourists. Some say it is because Serpentis discovered the secrets of the Coil and want to keep them for itself. Nothing strange about that. Trespassers beware.